Emma Sheppard (@Comment_Ed), mother to one son, Lead Practitioner in English and Founder of The MTPT Project explains how refusing to accept the social pressures surrounding parenting and maternity leave enabled her to transform her maternity leave from a career break into an opportunity for positive impact. When I began maternity leave in May 2016, two weeks before my due date, I felt the obvious relief at being ‘released’ from my 60 hour week and excitement at the impending arrival of my son; however, it didn’t take long before I began to feel restless, fidgety and bored. “You’ll feel differently when the baby comes,” my friends assured me, “You’ll be so busy with him, you’ll have no time for anything else”… and it was this exact possibility that made me feel slightly uneasy. Did becoming a parent mean sacrificing all other identities? Would the nerdy passion I held for literature and learning be completely eclipsed by a new obsession for nappies and baby yoga? Would my currently overactive brain magically stop demanding stimulation and problem solving following the birth? about it, the more I felt confident that being a mother, being myself and being a teacher were not separate entities: rather, they were three complimentary parts of my personality that could happily cohabit in the same headspace. Maternity leave, I realised, would be an amazing opportunity for me to take six months with my son to develop the skills and subject knowledge I never had time to focus on when I was drowning under the planning and marking that comes with a full time teaching timetable. Now all I needed was a community of role models to inspire me and give me a few tips about balancing my new-found FutureLearn courses with a bedtime routine. Initially, however, I found it very difficult to find parent-teachers who had done anything similar, and the responses I was getting from friends, colleagues and the social media community left me thinking that I might be a bit bonkers. Never disheartened, however, I decided that instead of worrying that I might be taking too much on, or being a bad mother, I would explore whether it was actually manageable to complete CPD with a newborn baby, so I completed online courses; I facilitated training at my school; I blogged; I read set texts and lots of very interesting articles and research; I learnt about early childhood development; I went on ‘school trips‘ inspired by my learning and my son’s development, as informed by my Wonder Weeks app; I appeared on Q&A panels, and I talked through my short, medium and long term career plans with my coach, all of this with my son happily strapped to me in a sling, or dribbling gleefully in his bouncer. What became very obvious to me through all of this was that the better I got at being a mother, the better I got at being a teacher, and the better I got at being myself: three complimentary, cohabiting identities. Now that I am back at work full time, I can see first hand the positive impact of the CPD I completed on my students, myself and my team: I’m able to teach Dickens to our top set Year 11 with confidence thanks to my ‘school trips‘ to museums and the resources I designed for local historical sites; I’ve got a wealth of extracts to draw on for the new English Language Paper 1 for the KS4 SOW that I write thanks to my FutureLearn course; I do my best to lead assuming everyone is doing their best, thanks to Mary Myatt’s book, ‘High Challenge, Low Threat, and I’ve helped to revitalise our reading lessons and Library because of my networking with Librarian and literacy colleagues. More importantly, though, because I have learnt to better balance these three parts of myself – teacher, mother, self – I’m working far smarter and am able to do a better job in far less than the 60 hours that exhausted me at the end of every week before my son was born. A big part of my CPD was networking through organisations like WomenEd, Teach First and the Teacher Development Trust, as well as through social media platforms like Twitter, Facebook and Staffrm. Through these channels, I was reminded time and time again of parents’ need for choice and flexibility in balancing their different commitments: some respondents were genuinely upset and personally offended that I would suggest a parent “work” whilst on leave; whereas others shared a very familiar feeling of isolation at being bored to tears by the typical baby routine, craving professional stimulation that they felt would result in accusations of somehow failing as a parent. The more I attended networking events (with my son! ), the more I met teacher-parents who had achieved far more impressive CPD goals than I could ever dream of, and the more I realised that a network and support system that understood the world of teaching and parenting could be a really helpful thing. It probably won’t surprise you to know that a lot of the articles I read as part of my research for The MTPT Project focused on gender inequality, the gender pay gap and the expectations of women in domestic and professional spheres. For a while, I was a big angry patriarchy-hating feminist, very concerned about the impact that becoming a mother would have on my career progression in comparison to a man’s, but the more I spoke to the millenial males around me, the more I realised that this project could achieve more than simply connecting likeminded mothers: it could help to reduce the teacher retention crisis; it could help to change attitudes towards flexible and part time work; it could increase the percentage of female leaders; it could have a significant impact on the quality of teaching received by underprivileged students; it could empower more men to take advantage of their shared parental leave, which in turn, would have a significant impact on their children’s wellbeing. So, if (and it’s a big ‘if’!) 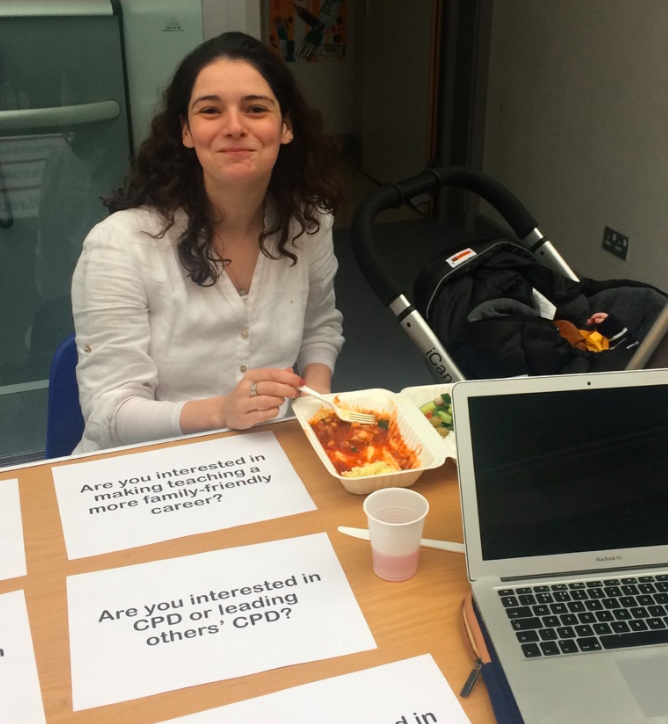 you choose (and it’s entirely your choice) to complete CPD whilst on parental leave, I hope that The MaternityTeacher PaternityTeacher Project can provide you with a supportive and inspirational network to do teaching and parenting in a way that makes you happy.